The Big East has developed a bit of a reputation as the Rodney Dangerfield of the major BCS conferences-getting no respect. Despite the fact that they fielded a number of talented teams, and produced no fewer than 3 first round draft picks in the NFL Draft. The fact is, there’s plenty of talent to be had out of the Big East, and with a number of interesting stories happening at a number of schools, the Big East may well produce another new conference champion, and another school may rise from the ashes to see itself in a BCS Bowl. With a variety of schemes being employed, and with some top tier talent in the conference, there’s no shortage of exciting games on the schedule, and no shortage of teams primed to shatter the perception of the Big East as a second tier conference. With a lot of teams to like, and none that stand out, SportsLife will break down the grain from the chaff. READ MORE HERE. I hope it's okay if I put this here, but I just started a new comm for just UT Football and other UT sports. Please join if you'd like to come talk about UT sports, even if you don't attend UT!! Congress needs to stay out of sports! Just turned on the tv and it was ESPN and a Congressman from TEXAS is talking about putting into effect a bill that would make the BCS go to a playoff system WTF? Is this something that Congress should be worried about? One of the best pictures from the game. I'm a Sooner. And I'm rooting for OSU against OU. As a die-hard Sooners fan, I am rooting for OSU against OU this weekend. I'm tired of all this talk of tiebreakers and head-to-head matchups. So long as OSU wins this weekend, the whole nonsense goes away and we can swiftly anoint a conference champion. Granted, it's going to be tough. OSU's primary running back, the best in the whole league, has a knee injury. I've also heard it said that their quarterback might be questionable. I don't think I even need to mention that OU has owned their in-state rival OSU lately. Still, I've got hope. GO OREGON STATE BEAVERS! BEAT OREGON! OREGON STATE, PAC-10 CHAMPS 2008! Reliving rivalries in college football is a timeless experience. They happen at the same time every year, in roughly the same location, and many of the same people are there year after year. More importantly, you have spent your entire year either waiting for the change to pile it on, and knock your rival in the dirt once more, or to avenge a loss that marks you like a stain on your soul. College Footballs best rivalries involve usually close geographic rivals, historically back and forth games, where no team has ever been able to establish long term dominance in the modern era of football (Do those victories in the no helmet era really count? ), and two teams that just can’t stand each other. From the Battle For the Jeweled Shillelagh to the World’s Largest Outdoor Cocktail Party, these games are colorful, heated, and if the stars align just so, provide us with a masterpiece, nail biter game, resulting in a victory for our school, at the expense of our blood rival. Here’s a look at where five of the most heated rivalries stand in the topsy turvy world of the 2008 College Football season. So, except for Texas A&M (and probably Iowa State) the Big XII looks good. Maybe we can have another championship? 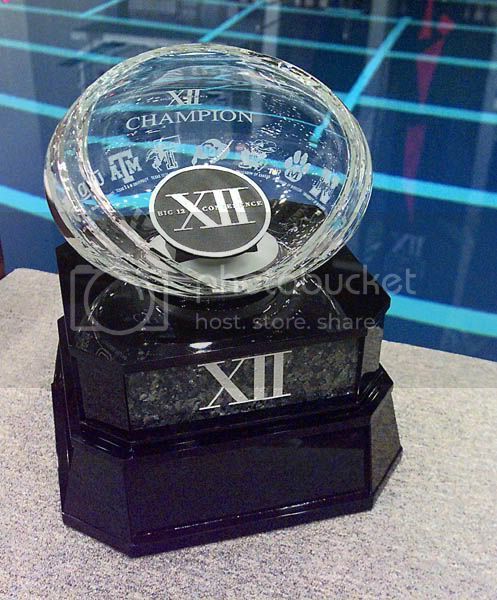 With a host of tough teams, and hostile home crowds, the Big XII is fast returning to it's former glory, and looking like the Big XII of years past, when the Red River Shootout meant a likely national title, the Cotton Bowl was a big deal, and plethora of traditional powerhouses. Fast foward to today, and it's looking a lot like all that's old is new again. Missouri, Texas, Oklahoma, Kansas, and Texas Tech are all highly touted coming into the season, but who's the real McCoy (and we don't mean Texas QB Colt) and who is the pretender to the trone? The Big XII title game could see some usual suspects this year, and we're ready for an exciting year of hard-nosed, close games in the Midwest. Let's take a closer look at the Big XII. Some people might think the up and coming Kansas Jayhawks, but let's not start the Rock Chalk Jayhawk chant quite yet. The North winners last year were the Missouri Tigers, and with arguably the best quarterback in the nation, Chase Daniel, leading the Tiger attack on offense, and a deep HB platoon on the ground, and a talented WR corps, they will likely field the best offense in the Big XII. While there are some questions on defense, they can still rely on top tackler Sean Witherspoon returning, and leading interception artist, S William Moore, also coming back. The key will be how healthy they can stay all season, as the depth on the O-line, and the front seven on defense, isn't what it ought to be right now. Still, Chase Daniels' mastery of the spread option attack employed by Coach Gary Pinkel, along with an older, wiser, defense, and even more fired up fanbase, should punch the Tigers' ticket to the Big XII title game. I HAVE MANY OF THE BIG XII SCHOOLS FOOTBALL MEDIA GUIDES AVAILABLE ON EBAY. (MU, BU, CU, OU, OSU, ISU, KU, KSU, TA&M, NU) THEY ARE ALL ENDING IN A COUPLE OF DAYS, JUST SEARCH YOUR SCHOOL AND "2008 FOOTBALL MEDIA GUIDES." GET ALL THE INFO YOU NEED ON YOUR TEAM ON THE UPCOMING FOOTBALL SEASON!!!!! GOOD LUCK! Get Final Four Text Alerts and more from AT&T! The Final Four® is here! Keep up with the action this weekend on and off the court in San Antonio with Final Four 2 Go text alerts from AT&T. Text MFF to 61234 to receive alerts about everything from the schedule of events throughout the weekend, a city guide to San Antonio and even the weather forecast! For diehard sports fans, also check out the complete mobile sports package by FOX Sports Mobile Pro. Stay in the know with daily audio highlights, photos & news and also track games with live play-by-play graphics, in-depth player stats and scores. Hey everyone, new member here so forgive me if this is a repeat question. "So hey, Fran: if you're looking for a summer job, I know this great auto dealership in Norman...."
Wow...that's a pretty harsh punishment. So I just saw the new trailer for NCAA Football 08 for the 360 and I am excited to get it. I am wondering if anyone here has a 360 and if anyone would want to do a tournament? Thought you might be interested in a site AT&T has launched that lets you create a tribute video mashup of your favorite college basketball team, and share it on their site. You can use exclusive team footage, school fight songs, team graphics and personal photos to create your video. You will also be entered to win prizes that include school-specific merchandise, a laptop computer, and a Samsung BlackJack phone. 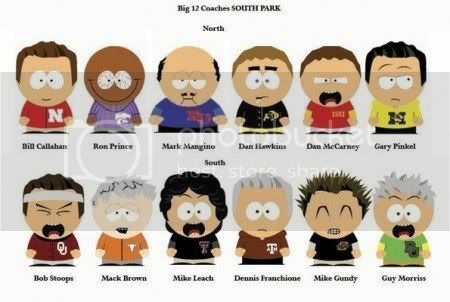 Big 12 coaches...South Park style!